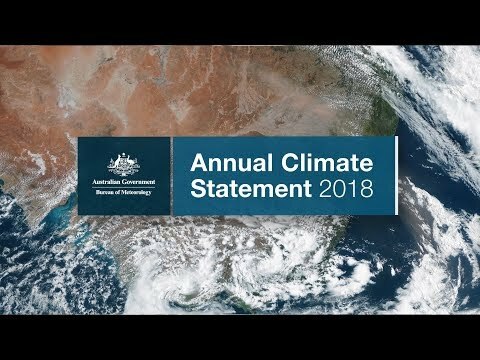 2018 was Australia's third-warmest year on record (the national temperature dataset commences in 1910). Australia's area-averaged mean temperature for 2018 was 1.14 °C above the 1961–1990 average. Maximum temperatures were the second-warmest on record at 1.55 °C above average, coming in behind +1.59 °C in 2013. Minimum temperatures were 0.73 °C above average, the 11th-warmest on record. 2018 annual mean temperatures compared to historical temperature observations. See also maxima and minima. The 11-year mean temperature for 2008–2018 was the highest on record at 0.77 °C above average. Only one of Australia's warmest ten years occurred before 2005, and nine of the last ten years have been warmer than average. Warming associated with anthropogenic climate change has seen Australian annual mean temperatures increase by just over one degree since 1910. Most of this warming has occurred since 1950. The Indian Ocean exerted a strong influence on Australia's climate during 2018. Dry conditions persisted over most of Australia during spring, associated with the positive phase of the Indian Ocean Dipole (IOD). The tropical Pacific Ocean had less of an influence, starting the year with a very weak La Niña that decayed during February, and had little impact on Australian rainfall, before moving into neutral conditions (neither El Niño nor La Niña). While there were signs of a developing El Niño from late winter, conditions failed to progress to a fully-fledged event by year's end. Annual mean temperatures for 2018 were above average for nearly all of Australia, and very much above average for most of the mainland except parts of Western Australia, mostly in the north and west, and parts of eastern Queensland. It was amongst the six warmest years on record for all States and the Northern Territory, and the warmest on record for New South Wales. All capital cities except Melbourne and Perth ranked amongst the eight warmest years on record for annual mean temperature. Hobart had a particularly warm year, with annual mean temperatures the second-warmest on record. Days were exceptionally warm for Canberra (annual mean maxima warmest on record) and Darwin (second-warmest on record), and also warm for Brisbane (fourth-warmest on record) and Sydney (fifth-warmest on record). Nights were warmer than average for each of those cities, but not especially so. Both days and nights were much warmer than average for Adelaide (maxima eighth-warmest on record, minima eleventh-warmest on record), and warmer than average for Melbourne, although outside the top ten. In Perth days were warmer than average. 2018 annual rainfall compared to historical rainfall observations. About deciles. Nationally-averaged rainfall for 2018 was 412.8 mm, 11% below the 1961–1990 average of 465.2 mm, making it Australia's 39th-driest year in a record spanning 1900 to the present. Rainfall for the year was very low over the southeastern quarter of the mainland (seventh-lowest on record), with much of the region experiencing totals in the lowest 10% of historical observations. Annual rainfall was above average between the northwest coast of Western Australia and the southeast of that State. Rainfall was particularly low over the mainland southeast from April, with rainfall deficiencies increasing during the year for many areas. September was record-dry, but the final three months of 2018 were wetter in some areas. The dry conditions over the southwest of Western Australia and the southeast of the continent during 2018 were likely driven by both natural variability and climate change. While low rainfall has persisted over many areas of the southeast for more than 12 months, the positive IOD in spring significantly exacerbated drought conditions across parts of Queensland, New South Wales, Victoria, South Australia and Tasmania. The dry conditions were also somewhat consistent with long-term rainfall trends, as detailed in the 2018 State of the Climate Report. Persistent very high temperatures throughout the year also contributed to record high rates of observed pan evaporation for winter and spring in New South Wales and Queensland. The year was particularly dry for Melbourne, its 27th-lowest annual rainfall on record, in 161 years of observations. Adelaide, Sydney, Brisbane, and Canberra all experienced a drier than average year. For Darwin, the year was slightly wetter than average, while annual rainfall was near average for Hobart and Perth. The global mean temperature for January to November 2018 was 0.66 ± 0.1 °C above the 1961–1990 average. This places 2018 on track to become the fourth-warmest year on record for global mean temperatures since 1880. The most recent four years—2015, 2016, 2017, and 2018—have been the four warmest on record. Of these four years, the exceptional warmth of both 2017 and 2018 has occurred without the presence of El Niño (which typically boosts global temperatures). All of the ten warmest years have occurred between 1998 and the present, with El Niño contributing in five of these years. The warmest year on record was 2016, some 0.8 °C above the 1961–1990 average. Global annual mean temperature anomalies (as calculated from the 1961–1990 average), derived from a five-dataset mean. The black line shows the 11-year moving average. Global mean temperatures were very high throughout the year, with all months to November amongst the six warmest on record for their respective months. Global temperatures have increased by approximately 1.1 °C since the pre-industrial period, and no year since 1978 has observed a global mean temperature below the 1961–1990 average. Based on preliminary data for January to November 2018, temperatures were warmer than the 1961–1990 average across nearly all of the world's land and ocean areas, and warmest on record for parts of mainland Europe, around the Mediterranean Basin, across Turkey, and into parts of Western Asia and the Caspian Sea region. The ocean surface was warmest on record in an area of the Southern Ocean around and east of New Zealand. The extreme warmth in Europe was reflected in significant weather events during 2018, which included extreme heat and drought in northern and western Europe. Elsewhere in the world, extreme heat followed major floods in Japan. There were destructive floods in southwest India, major hurricane impacts in the United States (Florence and Michael), and destructive wildfires in numerous regions, including Greece, western Canada and California. However, droughts eased in east Africa and in the Cape Province of South Africa. The estimated global mean temperature is produced using the average of several global climate datasets. The datasets include three observational datasets, and two estimates of global mean temperature based on comprehensive reanalysis. The observational datasets used are the UK Met Office Hadley Centre (HadCRUT4), the US National Oceanic and Atmospheric Administration (NOAAGlobalTemp), the US Goddard Institute of Space Studies (GISTEMP), while the reanalyses datasets are the European Centre for Medium-Range Weather Forecasts (ERA-Interim) reanalysis, and the Japan Meteorological Agency (JRA-55) reanalysis. Reanalyses are generated by feeding a comprehensive set of meteorological observations into numerical weather models to achieve complete global coverage of atmospheric behaviour. Temperature values from the observational datasets commence in 1880 for NOAAGlobalTemp and GISTEMP and in 1850 for HadCRUT4, while the two reanalysis datasets commence in 1958 for JRA and 1979 for ERA. Warmth was widespread and persistent throughout 2018—the monthly national mean temperature was amongst the ten warmest on record for their respective month during January, February, March, April, July, October, and December, and was at least 0.25 °C above average in each of the remaining months except August. 2018 was Australia's third-warmest year on record, with the annual national mean temperature 1.14 °C above average, just behind +1.15 °C in 2005. The warmest year was 2013 with +1.33 °C. Annual mean temperatures were above average for nearly all of Australia. They were in the highest 10% of historical observations for nearly all of New South Wales, Victoria, South Australia, and Tasmania; most of Queensland except for the southern Peninsula and areas along the east coast; much of the Northern Territory except for areas of the central north and Alice Springs District; and for large areas of Western Australia in the southeast and inland west. It was amongst the ten warmest years on record for all States and the Northern Territory. Maximum temperatures for the year were also above average across nearly all of Australia. They were in the highest 10% of historical observations for nearly all of Australia, except for parts of west coast, central, and southern Western Australia and an area of southern Cape York Peninsula in Queensland. Annual mean minimum temperatures were also above average for much of the country, although some areas were below average. Annual minima were in the highest 10% of historical observations for parts of southwestern Queensland; central coast, northern and western New South Wales; southern Victoria; southern South Australia to southeastern Western Australia; and all of Tasmania. Mean minimum temperatures were near average for large areas through eastern Queensland, pockets of west coast Western Australia and a large area of the Kimberley and northern Interior, parts of the Top End, and the southwest of the Northern Territory. Minima were cooler than average for much of Western Australia's Kimberley. Australian annual mean temperature anomalies, compared to the historical average. The black line shows the 11-year moving average. January and February were warmer to very much warmer than average over most of eastern Australia and South Australia. Days were cooler than average over large areas of Western Australia coinciding with above average rainfall. There were several significant heatwaves in southeastern Australia during January, particularly in New South Wales and northern Victoria. March was also a warmer than average month for most of Australia, although above average rainfall and a stormy period led to cooler than average days in northwestern to central northern Queensland. The first half of April saw many high temperature records set across southern Australia (see the Special Climate Statement Persistent summer-like heat sets many April records). For the month as a whole, mean and maximum temperatures were in the highest 10% of historical observations for most of the country. Numerous station records for highest April mean maximum temperature were set in Victoria, New South Wales, South Australia, Western Australia, and the Northern Territory. Mean maximum temperatures for April were either the highest, or second-highest on record for April for New South Wales, Victoria, South Australia, Western Australia, and the Northern Territory. Maximum temperatures were warmer than average and minimum temperatures were cooler than average through May to September. July maxima were second warmest on record for Australia as a whole, and within the warmest 10% of historical observations for that month for most of the country, with station records for highest July mean maximum temperature set in eastern New South Wales and southeast Queensland as well as part of Western Australia. The Northern Territory and all States, except Tasmania, observed mean maxima amongst the ten warmest on record for July. Minima during August were particularly cool across northern Australia and the eastern mainland, largely corresponding to those areas which experienced clear skies and below average rainfall for the month. In September, cool nights were observed across the mainland southeast. September mean minima were the lowest on record for a large area spanning central-northern and northwestern Victoria and northern agricultural districts of South Australia. There were significant frosts affecting much of the grain-growing regions of northern Victoria and eastern South Australia during mid-September, with consequent crop damage. An increased diurnal temperature range (the difference between daily maximum and minimum temperatures) and increased occurrence of frosts are typical of eastern inland Australia during the cool season in drought years, due to reduced cloud cover, low humidity, and low soil moisture. October to December saw a return to above average maxima and minima across most of the country, and a very warm end to the year. Warmth was widespread for October, with mean temperatures for all States and the Northern Territory amongst the ten warmest on record for October, except for Western Australia. Persistent high daytime temperatures, combined with very high overnight temperatures, created severe heatwave conditions at the end of spring. Many records were set over northern Queensland from late November to early December (see Special Climate Statement An extreme heatwave on the tropical Queensland coast). The last week of the year again saw extreme high temperatures, this time affecting very large areas, from the northwest of the country into the inland southeast. Temperatures remained very high for multiple days, with the highest temperatures observed in northwest Western Australia, including the third-highest temperature on record for Australia during December; 49.3 °C at Marble Bar. A Special Climate Statement discussing the event will be released. For the month as a whole, December mean maximum temperatures were highest on record across large parts of northern Australia, extending from the inland Pilbara, across the Kimberley and much of the Northern Territory, to northwestern Queensland. Minima were also exceptionally warm for large parts of northern Australia, and highest on record for much of southeastern Australia. The frequency of extreme heat events has increased approximately fivefold since the 1950s. Research by the Bureau shows that climate change has contributed to an increased frequency and severity of extreme heat, heatwaves and elevated fire danger. The dry and hot conditions during both autumn and winter contributed to elevated fire dangers. Consistent with recent trends, 2017–18 saw another prolonged fire season, starting earlier in spring and ending later in autumn across many fire-prone regions of the country. Well above average temperatures, months of low rainfall and dry soils resulted in Forest Fire Danger Index (FFDI) levels remaining elevated well into autumn, and rising again quickly over winter and early spring. Observed changes over recent decades indicate New South Wales and Victoria are experiencing more severe fire-weather conditions during summer, as well as an earlier start to the fire-weather season with dangerous fire-weather conditions occurring significantly earlier in spring than they used to. Also consistent with recent trends, fire-weather conditions in July and August were unusually severe across much of eastern Australia, resembling conditions that typically occur at the end of spring, rather than the end of winter. A number of serious fires occurred during August, and fire danger periods commenced two to three months earlier than usual in parts of eastern Australia. Rank ranges from 1 (lowest) to 109 (highest). A rank marked with '=' indicates the value is tied for that rank. Anomaly is the departure from the long-term (1961–1990) average. Annual rainfall in 2018 was very much below average for New South Wales, Victoria, eastern South Australia, most of the southern half of Queensland, and parts of southwest Western Australia. Significant rainfall deficiencies increased across the year, with drought affecting large areas. Rainfall for the year was very low over the southeastern quarter of the mainland (seventh-lowest on record), with much of the region experiencing totals in the lowest 10% of historical observations. National rainfall for 2018 was 11% below the 1961–1990 average, with an Australian annual total of 412.8 mm (the 1961–1990 average is 465.2 mm). Compared to rainfall since 1900 (119 years), this makes 2018 the 39th-driest year on record. Annual mean rainfall (mm) for Australia since 1900. The black line shows the 11-year moving average. Rainfall for the year was below average for Victoria, New South Wales, the eastern half of South Australia, most of Queensland south of Cape York Peninsula, and South West Western Australia and areas along the west coast. Rainfall was also below average across parts of inland northern Australia between northwestern Queensland, the central Northern Territory, and the northern Interior of Western Australia, and also in pockets along the east and north coasts of Tasmania. Annual rainfall was above average for a large part of Western Australia, covering the coastal and western Kimberley, the northeastern Pilbara, much of the Interior and Goldfields, and the Eucla district in the southeast of that State, and extended into southeastern South Australia. Above average rainfall was also observed in pockets of the coast in the Northern Territory and large parts of Queensland's Cape York Peninsula. Australian monthly rainfall totals for 2018. The black line shows the 11-year moving average. January was a wet month for much of the tropics and for Western Australia, largely from the passage of tropical cyclone Joyce during the first half of the month, and a slow-moving intense monsoonal low later in the month. Numerous stations set records for high monthly rainfall totals, and flooding isolated some communities in the Top End and north of Western Australia. February continued wet for much of Western Australia, with tropical cyclone Kelvin causing flooding around Broome. Summer (2017–18) rainfall was the tenth-highest on record for Western Australia. Meanwhile, for much of the east, summer was drier than average, particularly for inland Queensland. Heavy rain across Queensland during March caused flooding that affected the North Tropical Coast, the Gulf Country, and parts of southwest Queensland. Across the southern mainland it was a drier than average month, while the remainder of autumn was drier than average for nearly all of Australia. May was wet in Tasmania and southern Victoria, with exceptional rainfall in the middle of the month causing significant flash floods in southeastern Tasmania. Autumn rainfall was the second-lowest on record for southern Australia (those areas south of 26°S), meaning a very dry start for the southern wet season (the southern wet season spans April–October). Winter was also drier than average for the eastern mainland and much of the north. While winter did see a strengthening of the westerly winds and some frontal systems, there was little linkage by these systems to the tropics and humidity remained very low over the south. Low humidity also contributed to a higher incidence of frost during winter. Wind speed in winter was above average over most of southern Australia, especially in July and August and particularly over Victoria and Tasmania. Low rainfall, low humidity, high wind speeds, and high daytime temperatures resulted in high evaporation, below-average soil moisture, and low streamflows during winter. Pan evaporation for June to August 2018 was the highest on record for the Murray–Darling Basin. The prolonged period of below average rainfall came to a peak in September, which was an exceptionally dry month for much of the country. Total rainfall for the month was the lowest on record for September at many locations in Victoria and Western Australia, and a handful of locations in New South Wales and Tasmania. September rainfall was the lowest on record for southern Australia, and for Australia as a whole, September was the second-driest on record for any month, behind April 1902. While October was drier than average for Victoria and Tasmania, and November rainfall was below average for much of eastern Queensland, rainfall during these two months was above average across much of the country. December also saw some areas with above average rainfall, notably across eastern Queensland, largely associated with severe tropical cyclone Owen, and to a lesser extent, tropical cyclone Penny. Rainfall for the month was also above average for western to northern central Victoria and adjacent parts of other States, as a result of a period of very heavy showers and storms around mid-month, to which Owen contributed by drawing moist tropical air south. Despite some significant rainfall in parts of eastern Australia during October–December rainfall deficiencies persisted in many areas at the end of December for periods up to around two years in length. The rainfall deficiencies that built throughout 2018 followed below average rainfall over longer periods (see Special Climate Statement An abnormally dry period in eastern Australia). Whilst there have been individual years in the last century with rainfall similar to or less than that of 2018, only twice since 1900 have such dry conditions been sustained for a period of nearly two years across the Murray–Darling Basin. The intensity of the rainfall deficiencies in the Basin over the last two years is on a par with the worst seen in any individual two-year period during the Millennium Drought, although dry conditions have not yet been sustained for as long as they were during that event. Eleven tropical cyclones were recorded in the broader Australian region during the 2017–18 Australian tropical cyclone season, equalling the long-term average (for all years since 1969–70). Five of the eleven tropical cyclones crossed the coast. Severe tropical cyclone Marcus was the strongest (category 5), having intensified over the Indian Ocean after passing very close to Darwin at category 2 strength. As of 31 December 2018, the 2018–19 tropical cyclone season has seen three tropical cyclones; Owen, Kenanga, and Penny. Owen fell below cyclone strength before made landfall near Port Douglas, north of Cairns, on 10 December. It re-strengthened over the Gulf of Carpentaria and made a second landfall on the west coast of Cape York Peninsula near Kowanyama as a low-end category 3 cyclone on 15 December. Kenanga was also active during mid-December, but stayed far off shore of northwest Western Australia during its brief existence. The tropical low which would become Penny emerged over the Coral Sea in late December, and crossed Cape York Peninsula before reaching category 1 strength over the Gulf of Carpentaria on the afternoon of the 31st. Penny made landfall on the western Peninsula south of Weipa on the afternoon of 1 January 2019. The tropical cyclone season runs from 1 November to 30 April. The broader Australian region covers the area south of the Equator and between 90°E and 160°E, and includes Australian, Papua New Guinea and Indonesian areas of responsibility. Rank ranges from 1 (lowest) to 119 (highest). A rank marked with '=' indicates the value is tied for that rank. Departure from mean is relative to the long-term (1961–1990) average. Australia was strongly influenced by both natural variability and climate change in 2018. In Australia, natural climate variability is largely dependent on season-to-season and year-to-year variability in the Indian and Pacific oceans. The year commenced with a very weak La Niña in the tropical Pacific Ocean, although this short-lived event dissipated during February, having had relatively little effect on Australian rainfall patterns over summer 2017–18. A neutral phase of the El Niño–Southern Oscillation (ENSO) then followed for the rest of 2018. Sea surface temperatures (SSTs) in the southern Tasman Sea rose to exceptionally high levels in late 2017, and remained record-warm in early 2018 (see Special Climate Statement Record warmth in the Tasman Sea, New Zealand and Tasmania). This warmth over the oceans contributed to warm conditions over land areas near the Tasman Sea, with many records set in southeast Australia (in particular Tasmania) during summer 2017–18. SSTs in the Tasman Sea remained much warmer than average through autumn, and along with associated lower surface air pressure over eastern Australia, may have contributed to the reduced strength and more southerly position of the westerly winds and rain-bearing cold fronts across southern Australia. SSTs in waters to the northwest of Australia, and more broadly across parts of the eastern Indian Ocean, were near average to cooler than average from May onwards. Cooler surface waters in this area limit the supply of moisture to the atmosphere and can change the path of weather systems coming from Australia's west, often resulting in less rainfall over central and southeastern Australia. As cool temperature anomalies in the eastern tropical Indian Ocean strengthened, waters warmed in the west of the Indian Ocean. A positive Indian Ocean Dipole (IOD) was active from early September, and decayed in early December, in line with its seasonal cycle. A positive IOD during spring typically reduces rainfall in central and southern Australia. While the IOD exerted a drying influence, a positive phase of the Southern Annular Mode (SAM) from late October to late December brought some relief from this drying influence in eastern mainland Australia during late spring. Positive SAM during spring and early summer is associated with increased onshore flow in parts of eastern Australia, which typically increases the likelihood of above average rainfall in affected regions. The Pacific Ocean steadily warmed from late winter, and by October SSTs in the eastern tropical Pacific Ocean had reached El Niño levels. However, atmospheric indicators—such as trade winds, cloudiness, pressure patterns and the Southern Oscillation Index (SOI)—had not shown a sustained response, and El Niño had not established by the end of the year. In addition to the influence of natural drivers, Australia's climate is increasingly influenced by global warming. Australia has warmed by just over one degree since 1910, with most of the warming occurring since 1950. The ocean waters around Australia have also warmed significantly over the past century, and have been very warm to record warm consistently across the past two decades. The background warming trend can only be explained by human influence on the global climate. The role of climate change is further discussed in State of the Climate 2018. There has been a significant decline in autumn and winter rainfall observed over southeast and southwest Australia in recent decades. The drying trend is particularly strong for May–July over southwest Western Australia since 1970, and for April–October over the southeast of the continent since 1999. A major influence on this drying has been the strengthening and extension of the subtropical high pressure ridge during winter, shifting many potential rain-bearing weather systems south of the Australian continent. This southwards shift of frontal systems is an expected outcome of climate change. Conversely, there has been an observed increase in rainfall over parts of northern Australia since the 1970s. This trend towards wetter years in the north is contributing to a slight increase in mean annual rainfall for Australia as a whole. Preliminary 2018 sea surface temperatures compared to historical records. (From the NOAA Extended Reconstructed Sea Surface Temperature dataset, ERSST v5). About sea surface temperature regions map and deciles. The preliminary annual 2018 sea surface temperature (SST) anomaly for the Australian region was the tenth-highest on record; 0.46 °C above the 1961–1990 average based on data for January to November from the NOAA Extended Reconstructed Sea Surface Temperature dataset, ERSST v5. SSTs around Australia have warmed by around one degree since 1910, similar to the increase in temperature observed over land. Above average annual SSTs have been observed for the Australian region for every year between 1995 and the present, and have been persistently high for the past decade. Preliminary annual average SSTs were very much warmer than average across the eastern half of the Australian region. SSTs were warmest on record for some parts of the Tasman Sea, and for the Tasman Sea region as a whole, mean SSTs were the second-warmest on record (+0.86 °C for January–November 2018, behind +0.96 °C in 2016). For the Coral Sea, SSTs were the fourth-warmest on record (+0.61 °C). For the year as a whole, SSTs were also warmer than average for most of the western half of the Australian region. They were near average around South West Western Australia, and for some parts of the eastern Indian Ocean, including around the Indonesian island of Java. SSTs were in the highest 10% of historical observations for large areas in the east of the Australian region throughout the year, and around northern Australia during January, April and May. Monthly mean SSTs for the Tasman Sea region were amongst the six warmest on record for each month of the year to November, except September (which was tenth-warmest). For the Coral Sea they were amongst the eight warmest for each month for the year to November. Elevated ocean temperatures have been a feature of recent years and 2018 was no exception, with a significant marine heatwave dominating the summer in the southeast of the Australian region. Long-lived blocking high pressure systems during the last three months of 2017 suppressed cloud development, allowing sunny conditions to warm the ocean surface, while low winds suppressed vertical mixing between the upper and lower ocean waters over the subsequent months (see Special Climate Statement Record warmth in the Tasman Sea, New Zealand and Tasmania). SSTs in the southern Tasman Sea during late 2017 and early 2018 were far warmer than previously observed at that time of year. January SSTs were the highest on record across a large area, affecting the eastern side of the Great Australian Bight and waters between Tasmania and New Zealand. For the Tasman Sea as a whole, the January area average SST was +1.66 °C (0.64 °C above the previous record high set in January 1935). January SSTs were also record warm for parts of the Arafura Sea, between Australia and New Guinea. SSTs for the Tasman Sea were second-warmest on record for February, and remained very much warmer than average over the region well into autumn, though anomalous warmth declined and shifted further east through winter. Waters were generally warmer than average around much of northern and eastern Australia throughout the year, and very much warmer than average across the east of the Australian region. Very much warmer than average SSTs were also observed in some waters to the north of Australia during autumn, and across large parts of the Southern Ocean during winter. Cool SST anomalies were seen in areas around Western Australia at times, particularly from late winter as a positive IOD began to develop. Between August and November cool anomalies were observed around much of the coastline of Western Australia and in adjacent parts of the Great Australian Bight and the eastern Indian Ocean. These anomalies were strongest in November, with below to very much below average SSTs along the coast of Western Australia between the Pilbara and the South West, and extending into the eastern Indian Ocean. For the globe as a whole, the preliminary average sea surface temperature for 2018 was the third-warmest annual value on record; with an anomaly of +0.53 °C based on values from the ERSST v5 dataset, which commences in 1854. The warmest year on record was 2016 (+0.62 °C), followed by 2017 (+0.54 °C). Global ocean heat content has also been at or near record high levels during 2018. For each three-month period (to July–September 2018), ocean heat content in the upper 700 m (data from 1955) and upper 2000 m (data from 2005) were the highest or second-highest on record. In each case, where 2018 was second-highest, the highest was in 2017 (see World Meteorological Organization Provisional statement on the State of the Global Climate in 2018). Sea surface temperatures were warmer than the 1961–1990 average across nearly all of the world's oceans, based upon preliminary data for January to November. They were warmest on record in areas of the Southern Ocean to the east and southwest of New Zealand. Annual mean sea surface temperature anomalies in the Australian region (as calculated from the 1961–1990 average). The value for 2018 is preliminary, based upon data for January to November. Please note this list is not exhaustive—for a more complete summary of individual events, including those affecting smaller geographical regions or causing limited damage, please consult the Monthly Weather Review. Tropical cyclone Joyce brought heavy rainfall to the north and west of Western Australia in the second week of January; minor flooding resulted in the De Gray and Gascoyne river catchments. There was an intense monsoonal low in late January, bringing heavy rainfall, damaging winds, and flooding to the Top End in the Northern Territory and the north of Western Australia. A number of stations observed daily or multi-day rainfall records, with major flooding resulting along Lower Daly River in the Northern Territory. 380 residents were evacuated to the Darwin Showgrounds until waters subsided, and the community of Marrakai was isolated, while further west people in some west Kimberley communities were also isolated due to impassable roads, with major flooding around Broome. Hot and dry northwesterly winds, with a strong gusty change, affected much of South Australia on 6 January. Severe or higher fire danger was observed in 14 out of 15 districts, with catastrophic fire danger observed in the Mount Lofty Ranges and Lower South East districts. A major fire occurred at Sherwood near Keith, burning nearly 12 000 hectares, and affecting more than twenty farming properties, including the loss of six houses and several thousand livestock. January saw heatwave conditions both early and late in the month in southeastern Australia. Sydney (Observatory Hill), four other sites in the Sydney basin (Penrith, Campbelltown, Horsley Park, and Canterbury), and several sites elsewhere recorded their highest January maximum temperature on record on the 7th. Some of these exceeded their previous all-time maximum temperature record, and Penrith's 47.3 °C was the highest temperature observed in the Sydney region since 1939. Initial reports indicated hundreds of flying foxes died in the extreme heat in Sydney's western suburbs. Temperatures of 40 °C or above were observed across most of Victoria away from elevated regions on the 6th, with well in excess of 100 grass, scrub, or structure fires reported in the hot, windy weather. The 18th was also a very warm day for much of Victoria, with temperatures of 40 °C to 43 °C across most of the western half of the State, including a number of coastal sites. There were two large grass fires in the southwest, although they fortunately caused little damage to assets. For inland and eastern areas the 19th was the warmer day, reaching the mid−40s across the northwest. In Tasmania, a report from the Tasmanian Environmental Protection Agency (EPA) and Inland Fisheries Service (IFS) found that sustained warm weather during January led to very high river water temperatures in the Mersey River, which then contributed to the death of numerous trout, particularly around Merseylea. The very warm weather also stressed fish in the grounds of the Salmon Ponds in the Derwent Valley, killing at least half of the trout stock in some of the display ponds. A series of severe thunderstorms developed over southwest Western Australia on 25 February, causing damage in Rockingham, south of Perth, and flash flooding and damage in the Great Southern District. A farm shed was demolished and numerous trees felled in Kulin. The town of Kondinin suffered significant damage: six houses and the local primary school lost their roofs, and power lines and trees were downed. Thunderstorms produced heavy rainfall and flash flooding in Canberra on 25 February, with the Airport recording more than 60 mm in less than 5 hours, more than the station's average February total. Southwell Park (north of the CBD) received 124 mm in 6 hours. There were 250 calls to the ACT Emergency Services Agency requesting assistance. There were a number of significant storms which produced large hail in Queensland and northern New South Wales during February; including tennis ball sized hail near Boonah on the 11th, golf ball sized hail in parts of southeast Queensland between the 13th and 16th, and hail up to 8 cm in diameter in parts of central Queensland on the 20th. Tropical cyclone Kelvin made landfall near Anna Plains Station, approximately 250 km south of Broome, as a category 2 cyclone on the morning on 18 February. Heavy rainfall was recorded over parts of northwestern Western Australia, causing widespread road flooding around Broome, including significant damage to the Great Northern Highway. Broome Airport recorded more than 500 mm of rain between the 16th and 19th, contributing to a January–February total in excess of 1550 mm, setting a record for highest annual rainfall only two months into the year. Broome Airport has 128 years of observations. Heavy rainfall from late February into early March led to major flooding in Queensland's North Tropical Coast, affecting the Herbert, Tully and Murray, Johnstone, and Mulgrave and Russell catchments. Major flooding also affected the Gulf Country and river catchments in the southwest and southern inland Queensland, with major flooding at Winton and moderate flooding at Longreach. The North Tropical Coast again experienced flash flooding on 26 March, with more than 40 swift-water rescues performed. Flash flooding affected the region around Cairns, while Ingham was inundated for a second time, following flooding at the start of the month. Severe tropical cyclone Nora made landfall on 24 March between Pormpuraaw and Kowanyama on the west coast of Cape York Peninsula in Queensland. The cyclone damaged some houses and brought down numerous power lines and trees in the town of Pormpuraaw. The remains of severe tropical cyclone Nora tracked across the base of Cape York Peninsula and produced heavy rainfall, renewing major flooding in catchments on the north tropical coast. Tropical cyclone Marcus made landfall on the coast of the Top End as a category 2 cyclone on 17 March and passed directly over Darwin. Trees and power lines were brought down leaving over 26 000 customers without power. Marcus was the strongest tropical cyclone to affect Darwin since tropical cyclone Tracy (category 4) in December 1974. A new March record wind gust of 126 km/h was observed at Darwin Airport. Marcus rapidly intensified after it passed over the northern Kimberley in Western Australia and moved westward into open waters, reaching category 5 on the 21st and becoming the most intense tropical cyclone in the Australian region since severe tropical cyclone Monica in 2006. Hot, dry and gusty northerly winds ahead of a strong cold front led to dangerous fire weather across southwest Victoria on 17 March. At least 18 homes were destroyed, and hundreds of livestock were lost to the fires. Hundreds of people were evacuated, and 40 000 hectares were burnt out. On the south coast of New South Wales, a bushfire at Tathra on the 18th saw more than 70 homes destroyed and another 39 damaged in the blaze. Severe thunderstorms caused property damage in the South West Land Division of Western Australia during early and late March. Storms on 4 March removed roofs from buildings at Northampton and brought down trees and power lines. On the 30th thunderstorms caused widespread damage in the Central Wheat Belt and Great Southern districts, with buildings losing roofs, trees uprooted, and power poles knocked over. Strong cold fronts crossed southeastern Australia in the middle of April. Strong to gale force winds and thunderstorms affected southern parts of South Australia on the 13th and again on the 14th. The first front caused extensive areas of raised dust, while both fronts brought down numerous trees through the Adelaide and Mount Lofty Ranges and the State's southeast. The frontal systems also brought strong and gusty damaging winds to Victoria, including the State's strongest gust for the month: 128 km/h reported at Wilsons Promontory Lighthouse on the 15th. There were 850 calls to the State Emergency Service for assistance, mostly for fallen trees and debris on roads. The strong winds and low pressure also contributed to high storm surge tides. In Tasmania strong and gusty winds were common from the 13th to the 16th, associated with a series of cold fronts. Winds were especially strong on the morning of the 16th, with several reports of downed trees and damaged power lines. Many sites reported gusts well in excess of 100 km/h, peaking at 163 km/h at Maatsuyker Island. A complex low pressure system crossed Tasmania from 10 to 11 May. Rain and thunderstorms brought exceptionally high rainfall to the southeast of Tasmania, in particular to Hobart and the nearby Wellington Range where almost all sites reported their highest May daily rainfall on record (and in some cases their wettest day for any time of year) in the 24 hours to 9 am on the 11th. Much of the rain fell in about 6 hours on the evening of the 10th, leading to flash flooding in many streams in the southeast, and extensive damage to bridges, roads, buildings and other infrastructure. The library of University of Hobart was also flooded, with very significant damage to their collection, including many rare books. The State Emergency Service received 300 calls for assistance and there was over ninety million dollars in insurance claims reported, and nearly thirty million dollars in damage to municipal infrastructure. Comparison of the rainfall with standard design tools show the event had an annual exceedance probability of much less than 1%. Strong north to northwesterly winds with sustained gales and gusts up to 109 km/h were observed in southwest Western Australia late on 4 June and into the following morning. About 40 000 homes in the Lower West and South West districts were without power and storm tides along the west coast led to inundation of low lying areas around Busselton. The Barrack Street river level gauge on the Swan River in Perth reached 1.64 m, with some minor flooding of Riverside Drive reported. A rainband ahead of a cold front moved brought heavy falls over the Gascoyne and western Pilbara during the 4th to the 6th, with minor flooding reported on the Gascoyne River. A strong cold front crossed southeastern Australia on 17 July, followed by another front on the 19th, bring periods of strong and gusty winds, and moderate to heavy rainfall. Sites in coastal South Australia; parts of western, coastal and elevated Victoria; and western and southern Tasmania reported gusts over 100 km/h, peaking at 144 km/h at kunanyi / Mount Wellington and 141 km/h at Wilsons Promontory Lighthouse on the 17th. Low atmospheric pressure and strong onshore winds generated tides well above normal, especially on the Northwest Coast of Tasmania. Rain falling onto saturated catchments led to river rises, with minor flooding in several catchments. On the 19th the North Esk River at Corra Linn peaked just below the moderate flood level. With catchments across much of Tasmania already wet from above to very much above average rainfall over nearly all of Tasmania for July, significant river rises occurred several times during August, with a number of rivers repeatedly reaching minor flood level. On 14 August, The Esplanade at Huonville was closed to traffic as a result of minor flooding of the Huon River. Eastern Australia saw a very early start to the 2018–19 bushfire season, owing to unusually warm and dry conditions. There were between 80 and 100 active bushfires across New South Wales, with others in Queensland and Victoria during August. The most serious included a fire at Cape Conran, in eastern Victoria, on the 11th, and fires in the Bega Valley at Bemboka on the New South Wales south Coast, which destroyed three houses on the 15th. Also on the 15th, a helicopter pilot lost his life while water bombing a large bushfire in Mount Kingiman, west of Ulladulla, on the New South Wales central coast. Warm, dry, and windy conditions preceded a cold front which crossed New South Wales late on 15 September, intensifying already existing bushfires around the South Coast of New South Wales. The Bega Valley fire at Bemboka had been active since 15 August, and destroyed a further two homes (bringing the total to five) before it was brought under control near the end of September. In total, this fire burnt more than 19 000 hectares. Minimum temperatures were very much cooler than average for most of the mainland southeast around mid-September, with nights below zero across large parts of the grain-growing regions of Victoria and South Australia. Frost damage led to crops being cut for hay in a number of areas in northern Victoria and eastern South Australia. There were a number of severe thunderstorms in Queensland during October, including two tornadoes observed on the 11th, at Coolabunia (southeast of Kingaroy) and Tansey (near Murgon), as well as hail up to 7 cm in diameter in the Wide Bay and Burnett region, and a wind gust of 117 km/h and hail up to 6 cm in diameter was recorded at Rolleston on the 29th. A cold front with embedded thunderstorms and showers brought a cool and very wet day for Melbourne and surrounding suburbs on 6 November. Heavy rain accompanied the front on the 6th, while the following cold outbreak on the 7th also brought intense showers and heavy falls of small hail in the southeastern suburbs. Flash flooding affected multiple localities. There were more than 450 calls to the State Emergency Service for assistance, and crews rescued 14 people from vehicles trapped in floodwater. Although totals were generally between 15 and 50 mm, much of central southern Victoria and South to West Gippsland received more rain in just three hours than in the previous two months combined. Storms also affected New South Wales, with very large hail reported on the Mid North Coast between Hastings and Macleay on afternoon of 7 November, including hailstones up to 9 cm across at Kundabung. A pair of cold fronts with embedded storms crossed southeast Australia from the evening of 20 November, clearing by the morning of the 23rd. Strong winds accompanying the fronts caused blackouts affecting more than 100 000 premises across Adelaide and the hills, as well as numerous felled trees. The State Emergency Service received more than 1200 calls for help in total. In Victoria the rain caused some flash flooding, mostly about the northern suburbs, while there were traffic disruptions owing to road flooding, signals outages, and delays on some train and tram lines. The State Emergency Service received around 340 calls for assistance across greater Melbourne over the three days. In Tasmania, rainfall was very heavy in the north and west, with daily rainfall records for November set at Strahan, Queenstown and Cape Sorell and blackouts across parts of the north and northwest. A large low pressure system brought thunderstorms and heavy rainfall across the central coast of New South Wales on 28 and 29 November, resulting in localised flash flooding and severe transport disruptions. A number of sites set daily rainfall records for November. The State Emergency Service received over 100 000 calls for assistance across the Sydney, Illawarra, and Hunter regions and conducted at least 14 flood rescues. A prolonged heatwave in late November to early December saw temperatures soar well above 40 degrees over much of Queensland, with the most exceptional temperatures along the tropical coastline. Many sites broke November or annual temperature records, some by very large margins. Cairns Racecourse reached 43.6 °C, more than six degrees above the previous November record for any site in the Cairns area (37.2 °C at the Post Office in 1900 and the Airport in 1971). Many other locations observed record runs of consecutive hot days during this period of intense heat. The extreme conditions were also associated with the death of more than 20 000 spectacled flying foxes around Cairns. High temperatures, low humidity and strong westerly winds, coupled with antecedent dry conditions, led to elevated fire danger across much of Queensland. The forest fire danger index (FFDI) was extreme (over 75) across large parts of the State, and reached "catastrophic" levels (100 or above) at some locations; for example Rockhampton Aero reached a peak FFDI over 130. Queensland Fire and Emergency Services (QFES) reported that about 130 bushfires were being attended to in Queensland by 28 November, with over 716 000 hectares burnt between 26 and 30 November. On the 30th there remained 105 fires burning, and by 6 December over one million hectares had been burnt. Fires occurred across the length of the east coast, from just south of Cairns to the Gold Coast. Up to 800 residents of Deepwater were urged to evacuate on 26 November, and on the 28th around 4000 residents of Gracemere were evacuated. Nine dwellings were identified as destroyed and an additional eight damaged, along with dozens of sheds and other structures. Various degrees of damage to crops, horticulture, and livestock were also noted. Severe tropical cyclone Owen developed over the Coral Sea on 2 December, reaching category 1 strength before being downgraded while still well offshore of the north Queensland coast on the 4th. It crossed the coast near Port Douglas, north of Cairns, below cyclone strength at around 3 am on the 3rd, causing heavy rainfall. Owen passed into the Gulf of Carpentaria, and regained cyclone strength before turning back east and making a second landfall near Kowanyama on the western side of the Peninsula at category 3 strength early on 15 December. Owen produced steady heavy rainfall on its second pass, resulting in localised flash flooding. There were daily totals over 300 mm near Ingham on the east coast, including 678 mm at Halifax (a new December daily rainfall record for Australia). The reformed severe tropical cyclone Owen helped fuel a low-pressure system over southeastern Australia by drawing very moist, unstable air down from the tropics. Strong winds, heavy rain, and severe thunderstorms affected Victoria, New South Wales, and Tasmania over the 13th to 16th, following very warm humid weather the on the 12th. The storms brought 130.2 mm to Birchip in Victoria's northwest during the 24 hours to 9 am on the 14th, with flooding affecting around 20 homes. About a month's worth of rain fell over northeastern Victoria, with flash flooding stranding hundreds of motorists on the Hume Highway between Wangaratta and Wodonga, with 17 people lifted by helicopter from the roof of their vehicles. Later, on the 14th 41.2 mm fell in Melbourne, most of it in a 20-minute period after 5 pm. The State Emergency Service was called to rescue 25 people whose vehicles became trapped in flood waters during peak hour. Train lines in the eastern suburbs were seriously disrupted by flash flooding, while the inner east and southeast were most affected by building damage. Over a 48-hour period the State Emergency Service received over 1400 calls for help across Victoria, including more than 400 in the Melbourne metropolitan region on the evening of the 14th. Storms also affected the central coast of New South Wales between the 13th and 15th. Severe thunderstorms caused flash flooding across Sydney, and strong winds and rain caused power outages affecting 35 000 properties. The State Emergency Service received 5000 calls for help, with the majority coming from the northern and southwestern metropolitan region. In northeast Tasmania, the storms brought 173.8 mm to Gray in the 48 hours to 9 am on the 16th. Flood watches for minor to moderate flooding were issued across the northeast of the State. In South Australia the State Emergency Service received over 700 requests for assistance, including 250 calls for building damage. During the afternoon and evening of 20 December, the eastern half of New South Wales saw widespread thunderstorm activity, triggered by a low pressure trough moving through a region of high instability, characterised by warm and very humid sub-tropical air. Many areas experienced giant hail, damaging winds and intense bursts of rain. Supercell thunderstorms caused extensive property damage between 4 and 8 pm in Sydney, the Blue Mountains, and Central Coast regions, with hailstones with diameter greater than 5 cm reported at multiple locations, and up to 8 cm diameter in some locations. Estimated insurance claims for some 675 million dollars of damage have been reported. Exceptionally high temperatures affected very large areas of Australia during the last week of December, extending from the northwest of the country into the inland southeast. Temperatures remained very high for multiple days, with the event generally more of a standout for the persistence of the heat than for absolute extremes. Nevertheless, individual daily temperature records were observed at a number of locations. The highest temperatures were observed in northwest Western Australia, including 49.3 °C at Marble Bar on the 27th; the third-highest temperature on record anywhere in Australia during December. A Special Climate Statement discussing the event will be released. The tropical low which would become Penny emerged over the Coral Sea in late December, and crossed Cape York Peninsula south of Lockhart River on 30 December. The system reached category 1 strength over the Gulf of Carpentaria on the afternoon of the 31st, with Penny then making landfall on the western side of the Peninsula south of Weipa on the afternoon of 1 January 2019, before again entering the Coral Sea. All values in this statement were compiled from data available on the issue date. Subsequent quality control and the availability of additional data may result in minor changes to final values. The Bureau collects, manages and safeguards Australia's climate data archive. Several datasets have been developed from this archive to identify, monitor and attribute changes in the Australian climate. You can access these datasets on our website. This statement has been prepared using the homogenised Australian temperature dataset (ACORN-SAT version 2, released in December 2018) for area-averaged temperature values and the observational dataset (AWAP) for area-averaged rainfall values and mapped analyses for both temperature and rainfall.